I do believe if everyone (all mankind) started out on earth equally…physically and mentally…and lined up next to each other for the Race of Life…given the exact same obstacles (ahead of them) to deal with…some participants would handle the obstacles with little stress or distress…while others would let the first obstacles prevent them from continuing along the path to their personal fulfillment. I read two conversational sentences in the last Mitford series novel that spoke volumes to me Wednesday evening. I went to bed thinking about it and woke up yesterday morning with the scene and conversation swirling around in my imagination. Let me introduce Harley Welch to you (one of the colorful characters who lives in the fictitious town of Mitford, NC)…a man of many talents and, most importantly, the person who will always have your back through life. He has grown up dirt poor in Kentucky, has little schooling, and as a youth and young man resorted to what he called his ‘liquor-running’ days. A neighborhood child, a little girl, actually teaches him to read, write and love history while he protects and shelters her from an abusive father. 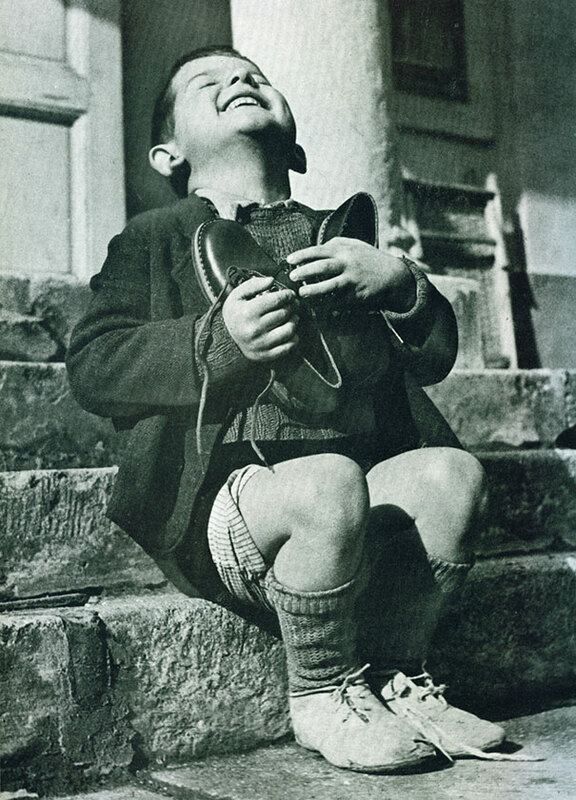 As fate would have it he ends up renting a basement apartment from Father Tim and later moves in with Father Tim’s adopted son, Dooley and his wife Lace (once the little girl who educated him). He is capable of doing just about any kind of work…a jack of all trades and he becomes an essential part of the family…more like a beloved uncle. One day he tells Father Tim about an episode at school that happened to him on his very first day when he was a little boy. He remembers being so excited to be going to school but he barely had enough clothing to cover himself. Attitude. I will never forget those two lines for as long as I live…life in a nutshell. Eloise is in training for when she has to push Grandmother Boo in a moving chair one day…hopefully not in the near future! 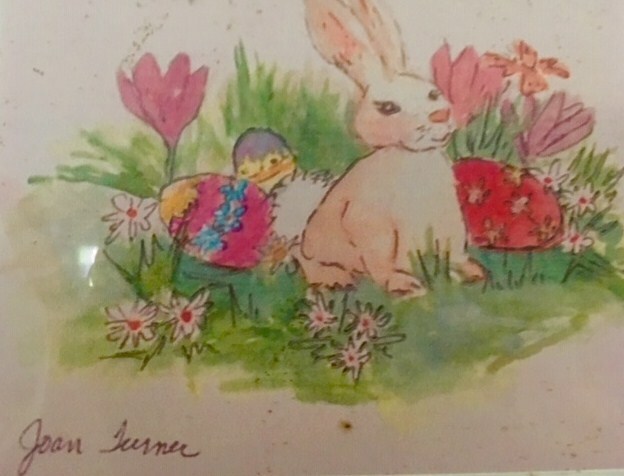 Joan…it just isn’t Easter without your precious watercolor painting welcoming in the season. 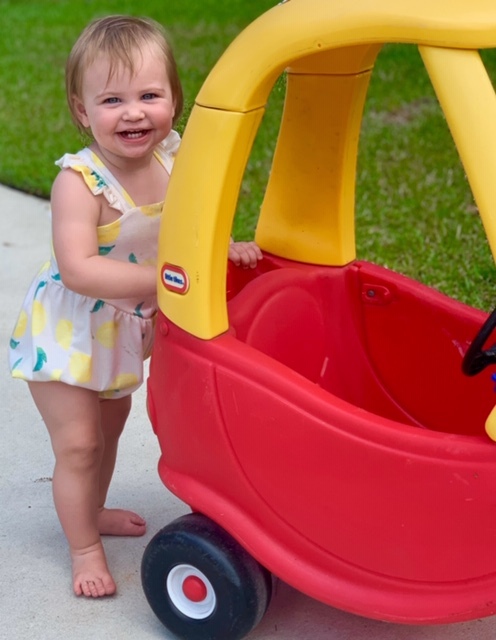 Wonder how many children have learned to walk behing a ‘cozy coupe’?Years ago when we first became grandparents ( GT will be 9 coming up soon ) we found one in the ditch down the road. It was packed full of red mud but the body and tires were still good. We brought it home,drilled holes to flush it out and painted it bright red. Even now it still is good to go and all of the little sisters coming behind GT have gone many a mile in the little red car. I love toys that last a long time. Thank you…you know I had forgotten about that! So much to think about these days and staying on the go. Taking care of mom every 5th day and going to our senior Center for painting on Friday and Thursday is the oil painting class out at Indian Creek. WT and I Joined the Wellness Center here so we go there every day we can. Needless to say When I get a rest day at home I love it! It looks like you stay very busy too with the Grand children. I am so very happy your wound has healed Becky! You look beautiful, radiant! May God continue to bless you all and have a joyful Easter! Joan…So happy to hear from you! Happy Hoppy Easter! So glad John and Mandy and the children will be here Sunday since Walsh and Mollie will be gone to her parents and Tommy and Kaitlyn will be going to home to Kaitlyn’s to visit her uncle is very sick. It will be a small Easter Egg Hunt….but the weather is supposed to be beautiful and just being together will be great. We are going to Toast for a Easter breakfast buffet after church and then let the kids hold their baskets and easter egg hunt…it will be fun. 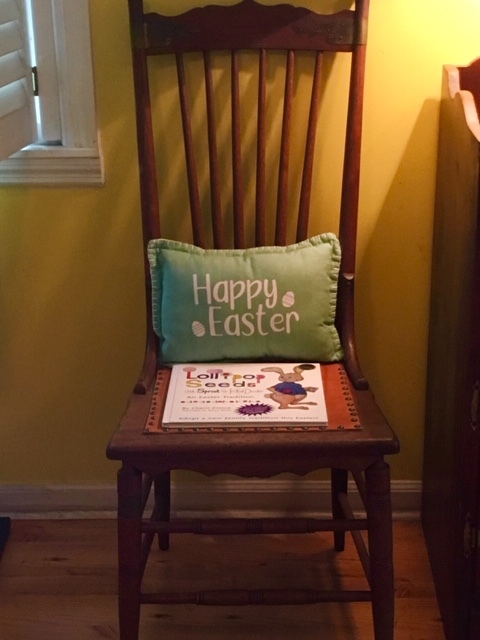 I can hardly wait to see your latest Easter painting…it will make my Easter!